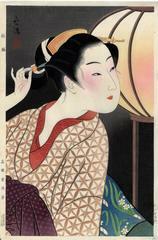 Half-length portrait of a bijin against a paper lantern adjusting her hair-pin and hearing the distant call of a Cuckoo. The carver was Maeda Kentarō. The printer was Ono Hikatarō. The Lesser Cuckoo (Cuculus poliocephalus) is called hototogisu (ホトトギス) and is frequently praised for its song, and ranked as her favorite bird by Sei Shonagon in her account of court life in Heian Japan, The Pillow Book. It is also a pivotal image in poem 81 of the Hyakunin Isshu poetry anthology. This information is taken directly from Wikipedia.